Bullet trains are considered by many to be one of the greener forms of transport, so imagine how environmentally friendly they might be if the sun’s power was harnessed to power them. 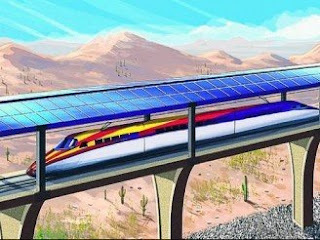 That’s precisely what Solar Bullet LLC hopes to do with its 220mph solar bullet train, which the company claims can travel from Tucson to Phoenix in just 30 minutes.Although the project is still in the very early stages of development, the company is hopeful it can start operating by 2018.Initially, trains would run on two tracks reserved for the direct route between Tucson and Phoenix. Eventually, though, four additional tracks would be built to extend the route north and south and take in additional stops, including Chandler, Maricopa, Casa Grande, Eloy, Red Rock and Marana.The system would need 110 megawatts of electricity to run, which would be generated by overhead solar panels mounted above the tracks, making use of the Arizona's abundant sunshine.The pair behind the proposed system, retired civil engineer Bill Gaither and his business partner Raymond Wright, believe their timing is right. US President Barack Obama has made it clear he's keen to investigate alternative energy transport projects, and last month he unveiled plans to put money into high speed rail networks around the country. Gaither and Wright are seeking to raise USD$35,000 for a feasibility study.According to Gaither and Wright: "Tourists will go out of their way to travel to Arizona to see its spectacular and accessible scenery as well as travel on its unique solar-powered high-speed rail system. New businesses and residents will be attracted to the forward-looking developments that will spring up along this new passenger-rail system. "The system will dramatically reduce their dependence on imported oil and at the same time, minimize greenhouse gas emissions. To do this, all the necessary technology and equipment are currently available in Europe, Asia and Arizona. We look for this innovative system and our new MotionSolar Technology to give Arizona a tourism, economic, employment and technological edge. "However the plan is not without its critics, not least for its huge price tag. The first phase is expected to cost about USD$27 billion.Other concerns have been raised over the practicality of the idea, including protecting, maintaining and cleaning miles of solar panels, whether the population of the area is sufficient (or interested enough) to make the line economically viable and environmentally sound, and even whether 110 megawatts would be sufficient to run it.New transport ideas and innovations can take time to catch on. High-speed railways have been fairly slow to take off since they were introduced to Japan in 1964 but are becoming more popular around the world for their energy savings, fewer emission and ever-greater speeds. The solar bullet train has reignited the debate at least how we can travel more quietly, cleanly and efficiently in the future.